Two new studies provide new techniques for measuring and controlling phonons. Two new research studies are offering novel methods for measuring and controlling phonons, or bits of energy which exist in quantum form in collective particles. Advancements like those described in these studies will offer insight into the behavior of individual phonons inside massive systems, which could, in turn, support a variety of practical applications, including quantum information storage. The first technique was demonstrated by Sungkun Hong et al. The team used light to control the state of single phonons, which enabled them to study the particles in their non-classical state. 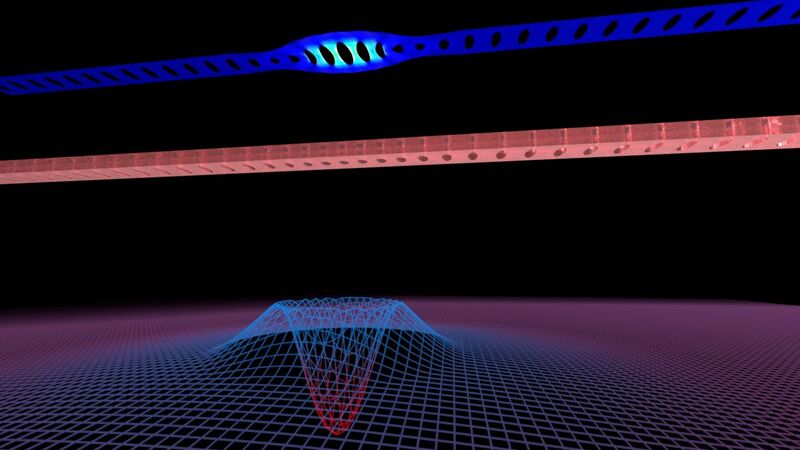 Until now, light could only be used to control phonons if they were coupled with other quantum particles. In contrast, this team first detected a single phonon in a nanomechanical resonator with a blue pulse of light, and then induced a state-swap interaction by applying a red pulse of light to the phonon. As they generated photons through these interactions, they reflected them back for analysis to single-photon detectors. The non-classical state of the phonon inside the resonator can, thanks to this process, be determined using the state of the photon outside of it. Yiwen Chu et al. created another new device that uses electromechanical forces to pave the way for advances in quantum research. It has historically remained a challenge to achieve a system with quantum-level control without using circuits or bulky cavities that rely on electromagnetic forces. A single device has been able to demonstrate a proof-of-principle of this kind of system thus far, but it hasn’t proved workable because it tends to lose qubits and is highly complex to fabricate. Chu and the team developed a simple device that is easily fabricated, can induce a wide range of quantum modes coherently, and allows for a high degree of control over the states of quantum particles. The device is made up of a piezoelectric resonator coupled to a qubit. When the resonator and qubit are strongly coupled, manipulating the qubit’s state allows for single phonons to occur within the resonator. The researchers believe their device can be improved in a number of ways, and that it might be able to make storing and transducing quantum microwave signals possible.